Newstead is a rural township on the Pyrenees Highway, 15 km south-west of Castlemaine and 110 km north-west of Melbourne. It is also on the Loddon River, south of where the river enters the Cairn Curran Reservoir. The Newstead shire (1865-1995), of 409 sq km, was generally south and west of Castlemaine. Although situated in the goldfields region, Newstead did not have particularly rich fields to attract rushes of miners. It grew from being a crossing place on the Loddon River, often for miners travelling to the Castlemaine and Mount Alexander diggings. A hotel was built near the crossing in 1853 and its name, Newstead, was given to the future township. A flour mill was built in 1856. In 1859 a National school and a Presbyterian church were opened, and in 1863 Baptist, Anglican and Methodist churches were opened. 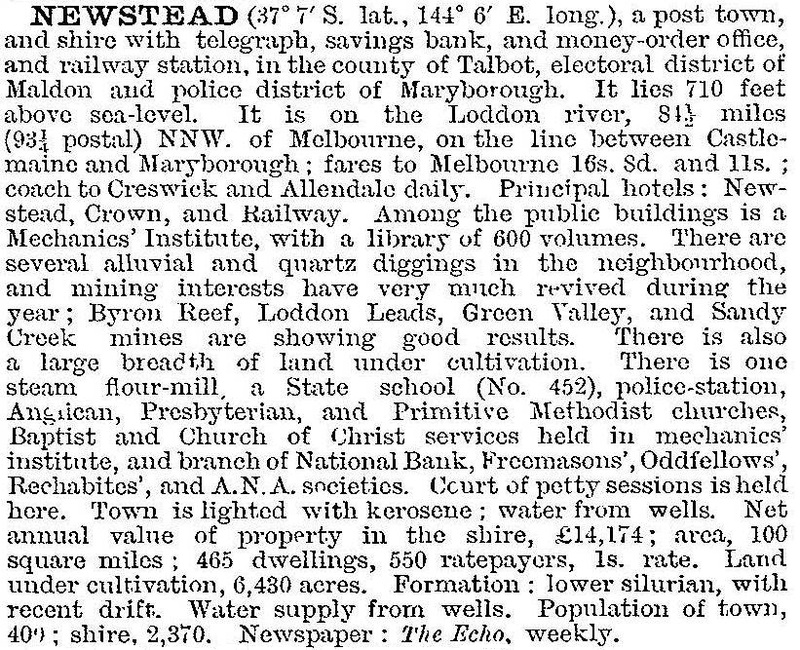 Newstead had mostly a farming population, which formed an agricultural society in 1860. By the mid-1860s there were also a brewery, a biscuit factory and two hotels. A three-storey bluestone flour mill was built in 1869, continuing until 1914. It was repaired in the 1970s. In 1868 a mechanics’ institute was opened, and mining re-commenced at Green Gully, about 2 km east of Newstead, in the 1870s. Mining was also carried out at Sandon, Strangways and Welshmans Reef, all within about 5 km of Newstead. A railway line from Castlemaine to Maryborough, via Newstead, was opened in 1874. Despite the mining activity the population of Newstead shire declined steadily during the 1880s to 1910s, and on 1 October 1915, it was united with Mount Alexander shire. 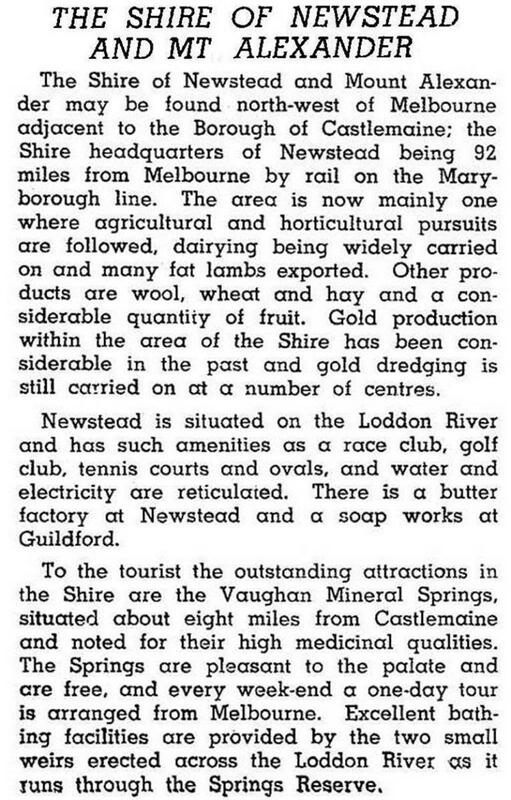 In 1934 a gold dredge began in the Loddon River near Newstead. Unitl its closure in 1947 the dredge extracted 5.3 tons of gold, a record for that class of mining in Victoria. About 100 ha of dredge overburden were reclaimed and levelled for pastoral purposes. As dredging drew to a close the Newstead district was agricultural and pastoral. The period after the 1940s to 1970 was one of further population decline, whereupon the shire’s population nearly doubled during the next 20 years. The township’s population was steady during the 1970s, but grew during the 1980s. Newstead shire, an area of 409 sq km, extended from Joyces Creek on its west to within a few kilometres west of Elphinstone on the Calder Highway. It skirted the south of Castlemaine, and included Campbells Creek. The Castlemaine-Dunolly railway, a freight line, runs in a loop through the former shire, passing through Campbells Creek, Yapeen and Newstead. The line passes by the Cairn Curran reservoir (1956). The Shire’s main agricultural pursuit was livestock grazing. Sheep and lambs (69,000) comprised 95% of the total head count in 1994. Newstead has Anglican, Catholic and Uniting churches, a school (80 pupils, 2014), a mechanics’ institute hall, two hotels, a motel, a general store, two recreation reserves, bowling and tennis facilities, a swimming pool, the former shire hall and the former court house (1863) which is on the Victorian Heritage Register. On the east side of the Loddon River there is a levee bank to protect the larger part of the town from flooding. The Maldon State Forest is north of the town. Joyces Creek, north-west of Newstead, was partly submerged by the Cairn Curran reservoir in 1956. Alfred Joyce’s Plaistow homestead is on the Victorian Heritage Register. The Newstead winery occupies part of a former butter factory. On 19 January 1995, Newstead shire was united with Castlemaine city and most of Maldon and Metcalfe shires to form Mount Alexander shire. Following the railway line's closure in 2004, the disused former railway station was identifed as a suitable building for a community arts space in 2014.